If your class will present the Thirteenth Sabbath program for the adults, practice one or more songs from the quarterly or the website (www.AdventistMission.org/mq-children) to sing during the program. If your class will not join the adults for a special program, present the following story during the mission time. You can invite Juniors or Earliteens to help present the program if you wish. This will help older children to become more comfortable in front of an audience and give the younger children different people to watch and listen to during the presentation. Send home a note to remind parents of the program and to encourage the children to bring their Thirteenth Sabbath Offering on September 30. 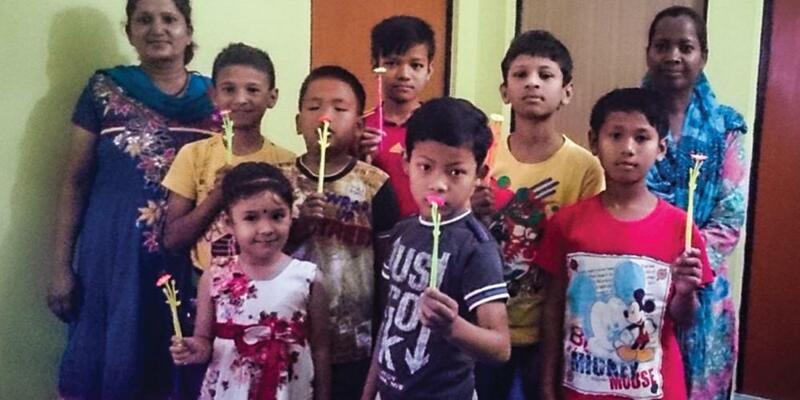 Remind everyone that their mission offerings are gifts to spread God's Word around the world, and that one fourth of our Thirteenth Sabbath Offering will go directly to help the people of the Southern Asia Division build dormitories at two Adventist boarding schools, seven churches in India, and one meeting hall in Bhutan. Narrator: Southern Asia Division is made up of three main countries–India, Bhutan, and Nepal. India has more people than any country except China–almost 3 billion people. The Adventist Church has sent missionaries to India for more than 100 years. Today almost 1.6 million people in India are Adventists. That's one Adventist for every 870 people. Since missionaries first went to India to share God's love with the people there, schools have been an important way to lead people to Jesus. These schools have been a strong influence on entire families who never knew Jesus. Even today many children from non-Christian homes study at Adventist schools because parents know their children will be taught well and will learn to be honest and kind. Let's meet Alia [ah-LEE-ah], whose life was changed because she attended an Adventist school. Alia [a girl]: My parents weren't Christians when I was starting school. But after a difficult experience in the first grade, they sent me to the Adventist school, hoping that I would do better there. The teachers were kind and helpful to me, and I learned quickly. I learned reading and math and geography, but my teachers taught me about Jesus too. My school doesn't hold classes on Saturday, and I realized that many of my classmates attend Sabbath School that day. So I went to Sabbath School too, for I wanted to know more about God. I liked Sabbath School a lot, especially the stories. I love stories, and my Sabbath School teacher told many stories about Jesus. I told my mother what I was learning in Sabbath School, and she came to church with me. She attended the adult class, and before too many months Mother gave her heart to Jesus and joined the church. I gave my heart to Jesus too; and when I was old enough, I joined the church. My father hasn't given his heart to Jesus yet, but he comes to church with us sometimes. I'm so glad that my parents sent me to an Adventist school. My whole life is different because of this school. Narrator: India has two main languages, Hindi and English, and many other state languages. Adventist schools in India teach in English. Being able to speak and read English helps children do better after they finish high school. Many children are being sponsored to attend Adventist schools throughout India. One of these children is Amol. He attends one of the schools that will receive new classrooms from our Thirteenth Sabbath Offering today. Amol, tell us about yourself and why you are studying at an Adventist school. Amol [a boy]: My parents were Adventist Christians. My father died when I was 6 years old, and my mother got sick and died a year later. My younger brother and I went to live with our grandparents, but life was difficult. My grandparents loved us, but they were old and couldn't afford to send us to an Adventist school. One day a pastor came to our village and held evangelistic meetings. My grandfather asked the pastor to help me go to an Adventist school, and the pastor found a sponsor for me. I really like my school. The teachers are nice, and the children are friendly. I just wish my little brother could study here, but he doesn't have a sponsor, and my grandparents can't pay his school fees. I remember that my mother wanted me to be a pastor. If God calls me, I will be happy to obey. Our school is new, and we need dormitories so that children don't have to walk long distances or stay with strangers in order to attend my school. Part of today's offering will help my school get a new dormitory. Thank you for helping children like me get a good education in a Christian school. Narrator: Thank you, Amol. Four Adventist schools will receive help from our Thirteenth Sabbath Offering today. But there is another project. It's to help build churches in India. Kevin is 9 years old and lives in western India. He is a child preacher. Kevin knows that when a child preaches, even adults listen. Kevin: I started preaching when I was 7 years old. My Sabbath School teacher invited me to speak for Children's Sabbath in church. I couldn't read much yet, so my parents helped me learn my sermons. We children practiced our parts a lot, and we were prepared. God really blessed, and, though I was nervous, God used my friend and me to speak to many people that day. Since then I've preached at many different churches in our area of India. I'm learning how to speak in front of other people, and this is a good skill for when I grow up. I think that when a kid preaches, people relax and listen with their hearts. People have told me that when they know a child is preaching, they like to invite their friends who don't go to church. It's a neat experience for the visitors, and they're often surprised that children can speak in front of adults. When I preach, I give an altar call. One time a woman came forward and asked for prayer. She said she was visiting the church and just learning about Adventists. She had planned to go somewhere else that day, but God led her to church. People in India are hungry to hear the good news that Jesus is the true and living God, that He loves them and wants to be part of their lives. The church in India has many programs to help members share God's love with their neighbors and family. But we need to learn how to reach them in more ways. Part of today's Thirteenth Sabbath Offering will help build a training center where pastors and Global Mission Pioneers and lay people can learn the best ways to reach others for Jesus. I'm too young to go there to learn how to share my faith, but one day I hope to! Narrator: Today we have the opportunity to help people in all parts of the Southern Asia Division learn about God through Adventist schools and a training center. Let's give a big offering to help them.